Last season (2017-18) I could upload a gpx file onto the EO browser Sentinel-2 image (or any image). This was very helpful in order to understand ice conditions compared to where we skated, wit or without problems. Today I could not upload such a file. Why is the uploader asking for a polygon? I used the “Upload data” tool. 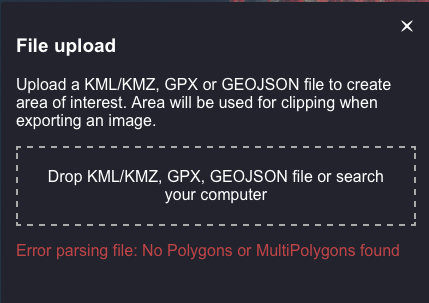 Is this for something else, and if so, how can I upload a gpx track today? Can you share the KML example here? My original track from Galileo Pro. It was too big (7 MB) for Google My maps, so I uploaded it to Skridskonätet, then downloaded the cleaned up version (2,3 MB) Skridskonätet-version. This one was accepted by Google My maps. From Google My maps I downloaded one kml and a kmz file. None of these files was accepted by EO Browser File upload, the error described was the same for all of them. The four files are put together in a zip archive. It seems all these files are lines rather than polygons, which is why it does not work. Yes they are. And I could upload them previous winter. Is that possibility taken away now? If not, how can I upload a track today? I suggest you QGIS or some other tool and convert lines to polygon, then it should work. I have checked that post, thank you for the tip. However, my track is not describing an/several area/-s but representing a skating tour from A to B. Sometimes the track intersects itself, but that is not relevant. So I am still searching for how to upload a gpx or kml/z track (line) onto the map in EO Browser. This is unfortunately not possible, nor do we have short-term plan to support it as the point of that functionality is to provide the polygon, which should be exported. If you will want to do that, you will have to convert it to polygon.